White House economic adviser Larry Kudlow said the Trump administration has restarted talks with the Chinese government "at all levels" and that the upcoming Trump-Xi meeting offers an "opportunity to break through". Helped by these comments, US stocks ended higher overnight, recovering from early session losses. The Dow index closed up 108 points at 24749. Looking ahead, trading today may be impacted by traders' reaction to a report on new home sales in October as well as a revised reading on third quarter GDP due later in the day. The DJIA closed above its opening price at 24749 after recovering from early selling pressure. The index found buyers again around the 24415 support level. The Dow confirmed its breakout after trading up $77 above Monday's high. 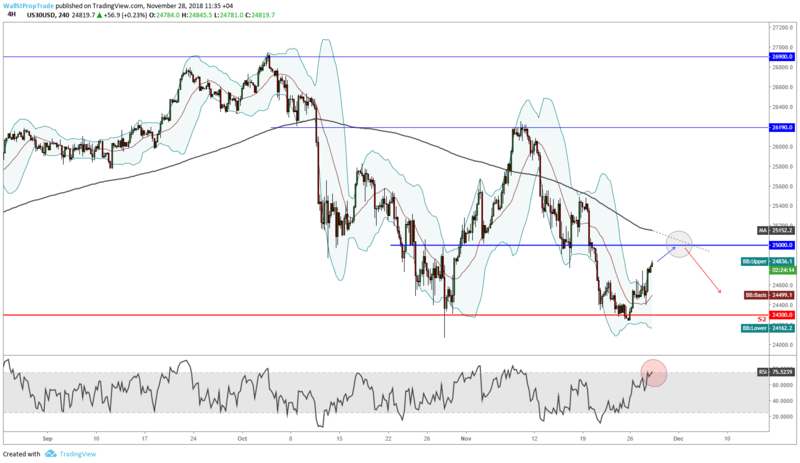 However, prices are trading close to a key level and 200-period MA at 25000 which has been acting as a strong resistance so far on a short-term basis. Further selling could move prices lower should the market break the 24300 support level and test October's close-by low at 24122.